Accompanied by a trumpet fanfare from the Royal Air Forces Association Swing Band, Richard Hildick-Smith, a former pupil and part of the 2008 Beijing pre-Olympic British Modern Pentathlon team, cut the ribbon to the new pitch. He was ably assisted by the School's youngest girl, Grace Hime aged 3, and Edward Scott-Bowden, aged 13, the School's oldest boy. "It's an honour to open this new pitch... Sporting proficiency is developed in your formative years so it's very important that children have access to such excellent sporting facilities as these early on..." said Hildick-Smith. 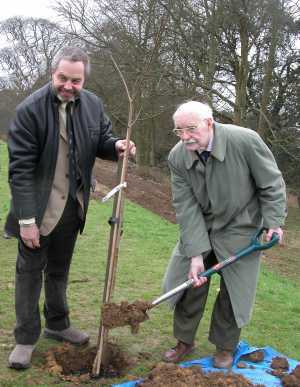 A tree donated by Grimshaw Kinnear, the pitch contractors, was planted by Gilbert Wheat, Headmaster between 1957-1978, to commemorate the new pitch. An inaugural hockey training session followed under the guidance of Mrs Heidi Bray, the School's Director of Sport, before visitors returned to the warmth of the School's elegant Victorian house for refreshments and a chance to hear more of the fantastic RAFA Swing Band. In commemoration of the 60th Anniversary of VE/VJ Day, the 8 piece band, with contralto singer Karen Litchfield, played numbers from the 1940s. "It was a joy to play in such a magnificent setting and to watch the children enjoying the music of the swing era. I know the School has always welcomed children from services families so we were delighted to support them with the opening of their impressive new pitch." said band leader, Peter Skellon.